For in-store inquiries, use sku #2375966. 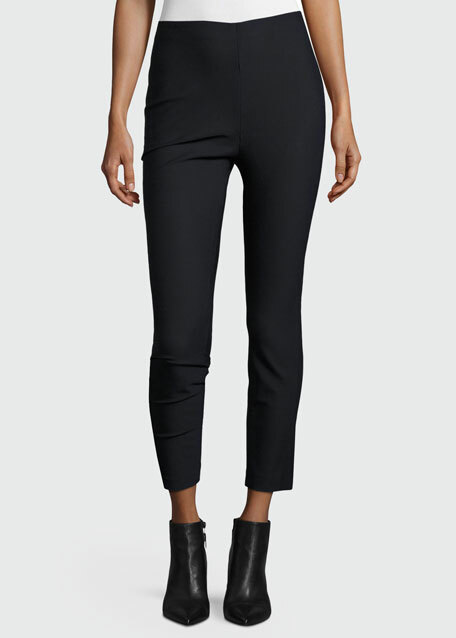 Derek Lam 10 Crosby leggings in cotton blend. Approx. measurements: 11" front rise, 25.5"L inseam, 36.5"L outseam, 6" leg opening. Fitted through skinny legs. Hem cropped above ankle. Hidden zip at seat. Cotton/spandex; dry clean. Imported. Natori "Labyrinth" two-piece shorty pajama set in geometric-print satin. Rounded notch collar; button front. Long sleeves; deep cuffs. Vented sides. Relaxed fit. Includes matching pajama shorts. Relaxed legs. Pull-on style. Polyester. Imported.